If you’re an active person, you’re always looking for new ways to get fit and challenge yourself. While traditional exercise methods like weight lifting and cardio can help you get where you want to go, they can become stagnant and cause a loss of interest. Many people have turned to yoga which can be beneficial by increasing muscles strength and tone as well as increasing flexibility. Balance is a key component to doing yoga correctly. As you improve, your sense of balance can greatly improve. This had led some people to try and challenge themselves while doing yoga by using a paddle board in the water while they work out which have been used as far back as the 16th century to travel or fish and is as popular today as it has ever been. Combining the two can provide a challenging, yet successful workout. Before you head out on the water for some stand up paddling fun, you want to make sure that you have the right gear first. If you look online, there are so many different options out there when you shop for a paddle board, which can make it confusing when knowing what to look for. Maybe you don’t know where to start or you’re worried you might pick the wrong one. It’s totally ok, we understand, you have a busy life, which is a good thing. That’s why SUP Boards Review is here to give you our personal review of our choice of the 5 Best Yoga Paddle Boards on the market today. A cause of hesitation for many yogis when it comes to using an inflatable paddleboard is whether or not it can support the weight of someone who may be a bit on the larger size. With the 10′ Isle Airtech Inflatable SUP for Yoga, that isn’t going to be much of a concern with a weight capacity of up to 240 lbs. With an inflated weight of just 20 pounds, carrying the ISUP board to the water isn’t a hassle. Designed with stability in mind to help you achieve your fitness goals, the Airtech board has a wide nose and tail outline to give you the best surface for every SUP yoga session you take part in. Made from military-grade PVC, the board is six inches thick, which will keep the little dings and any damage you may cause during your workout at a minimum. The board also comes equipped with a rail and deck mounted bungee system that can keep your things within arm’s reach. 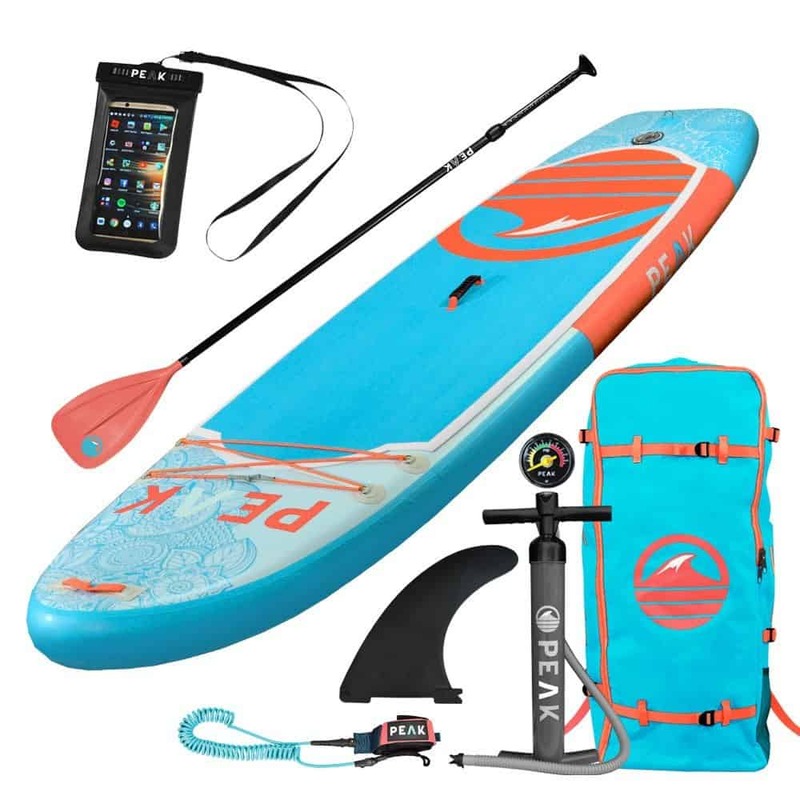 The 10′ Airtech Inflatable board from Isle surf includes an accessory bundle that provides you with the essentials that you need including a 3-piece adjustable aluminum travel paddle, a high-pressure air pump with pressure gauge, which inflates to 15 psi, as well as a removable travel fin system and carry-all backpack to take it anywhere with you. 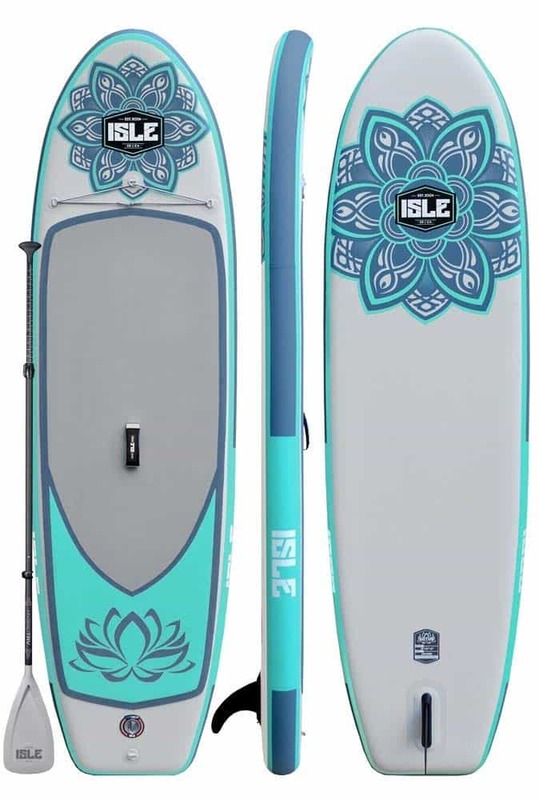 Using revolutionary iSUP technology, this stand up paddle board is 30% lighter when compared to other inflatable yoga paddleboards, all without compromising any of the quality you expect from Isle. Using a unique, high-end manufacturing process that uses a machine to coat the drop stitch with a special seal and bonding layer, which is then given a machine-laminating, higher-density PVC layer. All of the work that goes into creating the board results in you getting an iSUP board that is lighter, stiffer, and more durable without any extra weight added on. Weight: Board Weight 20 lbs. Max Weight Limit: Up to 240 lbs. Accessories: Adjustable Travel Paddle, High pressure pump, and Carry Backpack. Paddle boarding has become increasingly popular throughout the world for quite some time now. For some, it can be a great way to relax on the water without having to lug a boat around and for others, it can be a great avenue for a full-body workout whether you are paddling through the water aggressively or simply taking part in an inflatable sup yoga session. 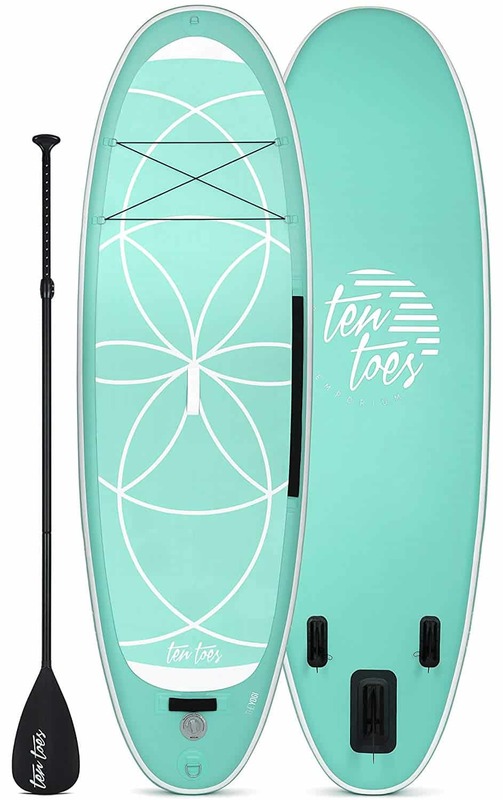 Either way, with the yoga inflatable paddle board from Ten Toes Yogi, you can enjoy every excursion you take. With SUPs, weight capacity can always be a concern for some people who may be larger, but still, have an interest in taking part in a SUP for yoga class. The board, manufactured by Ten Toes Yogi, a reputable brand in the industry, is crafted to be able to carry up to 275 lbs allowing just about anyone to enjoy a class out on the water. Made from unbreakable, military-grade PVC material. The use of cutting-edge drop stitch technology enhances the durability even more. Designed to fuse the fabric through the use of sturdy plastic threads during the sewing process, it is made to withstand just about anything, which reduces the chance that you’ll slip or slide over. The board’s deck is made from EVA textured foam with non-slip features, which can provide you with additional stability as well as comfort out on the water. Included with the board is a three-piece aluminum paddle that is adjustable from 3 feet all the way to 9 feet. Three removable fins attach to the bottom of the board and can easily be taken off or reattached depending on the water you’re going through. With an included air pump, the board from Ten Toes Yogi is easy to set up and rolls up easy once deflated for simple storage. While you’re on the water, 4 D-rings connected by a bungee cord give you a place to store your paddle or any extra equipment you need. Weight: Board Weight 37 lbs. Max Capacity: Up to 275 lbs. 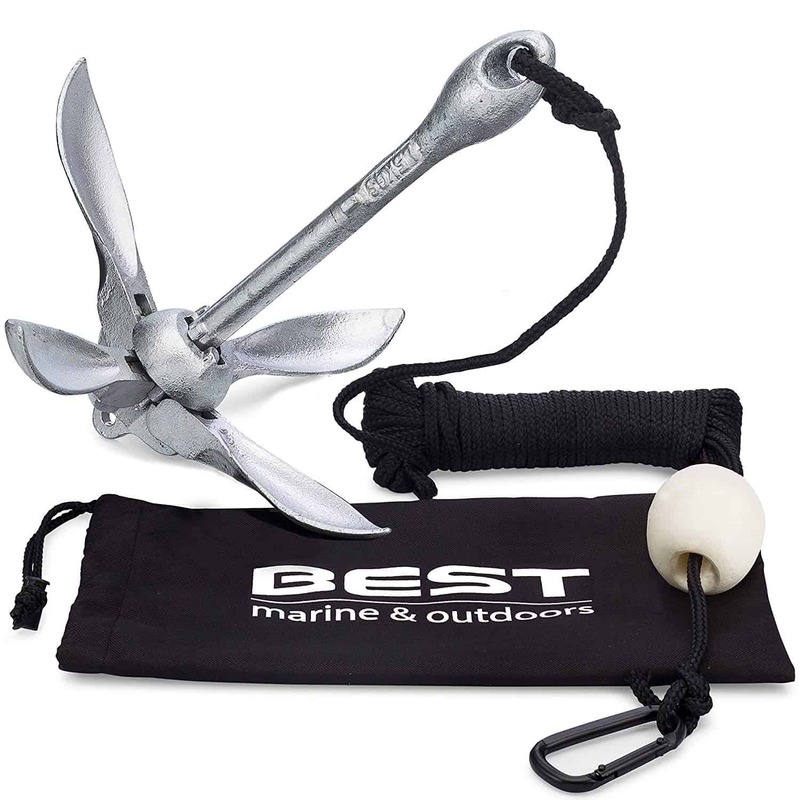 Accessories: 3Pc adjustable & lightweight aluminum Paddle, 3 fins, manual pump, & repair kit. When you first decide to give paddle board yoga a try, even if you’ve done yoga previously, it can be a bit intimidating once you’re out on the water. While the basics remain the same, it can take some time learning how to translate your workout from dry land to a floating board and not every board is designed with beginners in mind, unlike the aptly named Beginners and Yoga Inflatable Stand Up Paddle Board from Nixy. 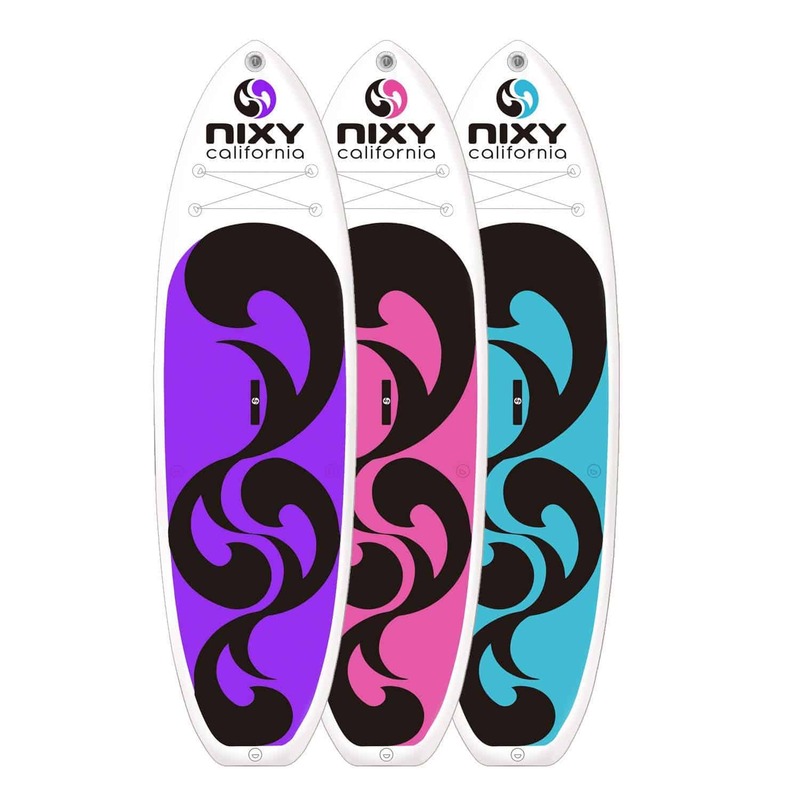 Part of the appeal with this board is that the manufacturer, Nixy, who are enthusiasts when it comes to water sports, only craft paddleboards that they would use themselves, so you know that they are putting a quality product on the market for you. Made with Fusion laminated drop stitch technology, the Stand Up Board is designed to be an ultralight board, weighing only 19 lbs. It can be inflated to 20 PSI, which is higher than just about any other SUP board out there, making it very rigid and stable on the water. A weight capacity of up to 400 lbs, ensures that just about everyone can use the board. Two D-rings on the board can be used for an optional kayak seat that is purchased separately, as well as 4 additional D-rings with a bungee cord that is perfect for securing your PFD or other equipment. A D-ring at the back of the board is perfect for attaching an anchor or leash. 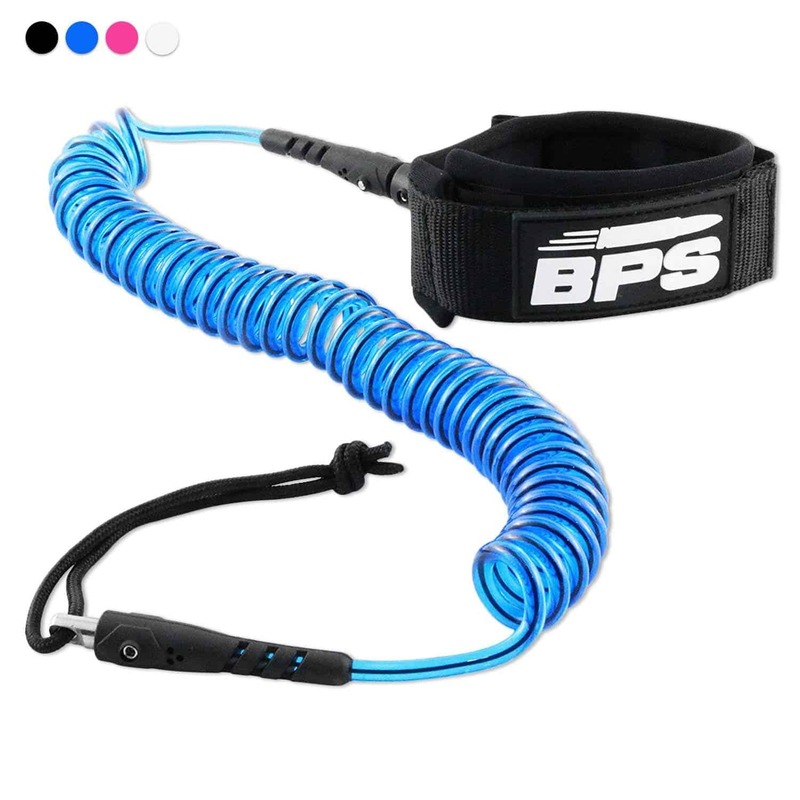 The coil leash that comes with the board is padded to offer additional comfort while you are paddling. The fins on the bottom of the board are tool-less. This means that they can be installed or removed without lugging around extra tools. You can do this by hand simply and easily, just slide the fin in and twist to install them. Weight: Board Weight 19 lbs. Max Capacity: Up to 400 Pounds. 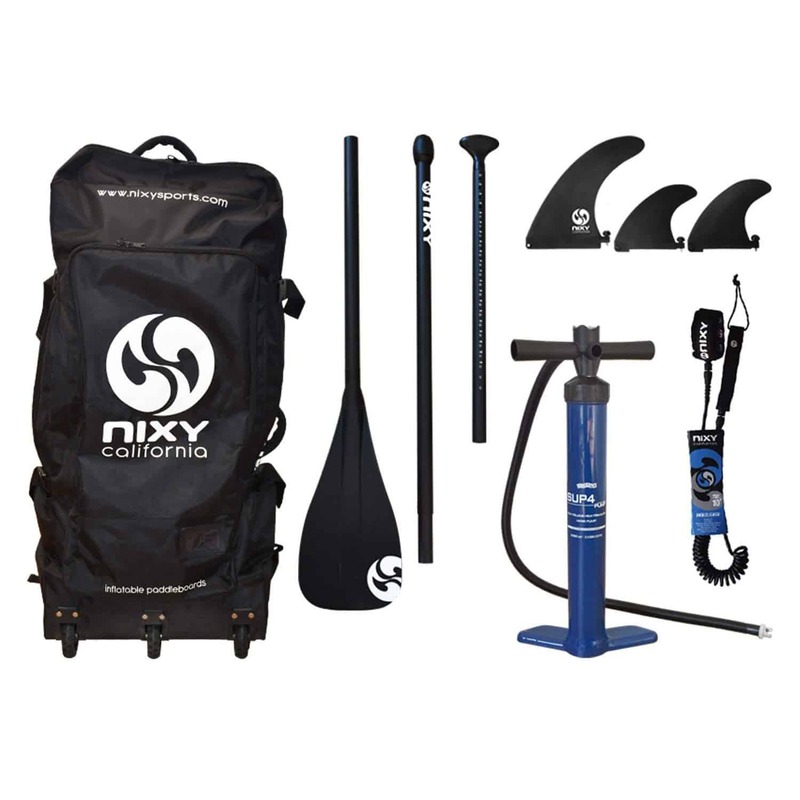 Accessories: Adjustable Paddle, Fins, Bravo 4D High pressure pump, NIXY Hybrid 10′ Leash, and Carry Backpack. Warranty: Risk Free Returns within 30 Days and 2 YEAR WARRANTY which covers everything outside of normal wear & tear. We’ve got you covered. 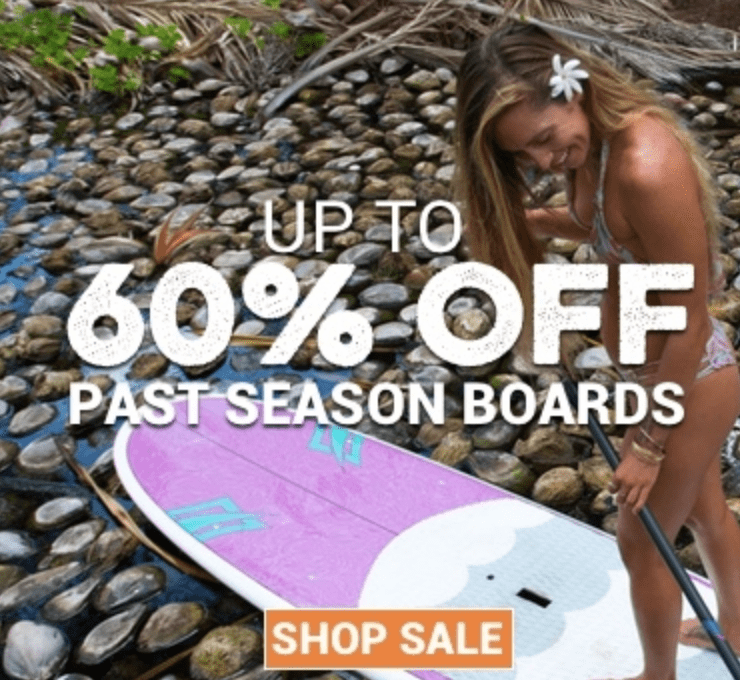 While many people may just be getting into a SUP yoga board and looking for a cost-effective and reliable board that will help them start enjoying the benefits that come with partaking in a SUP yoga class, others are looking for their next boards. They’ve made the journey from beginner to experienced and are committed to practicing yoga. For those looking for a forever board, you can’t go wrong with the Peak Inflatable SUP Board. Made from lightweight Military-grade, dual-layer PVC and using high-quality Korean drop stitching, the ISUP is designed to be extra rigid, giving you a hard surface to do just about every yoga pose you can think of. This rigidity also protects the board, keeping it from getting dinged up if you happen to drop or bump it. While the rigidity helps, a deck pad made from soft, EVA foam makes it comfortable for you to use, but also makes it family and pet-friendly for those lazy afternoons on the lake. Storing the SUP when you’re done for the day is no problem at all. When deflated, the board measures 36” x 14” x 12” and rolls up into a compact size. With the included cinch strap, it can fit just about anywhere from the trunk of your vehicle to the hall closet at home. Taking it on trips is easy too, with its included carry backpack, perfect for airline travel. 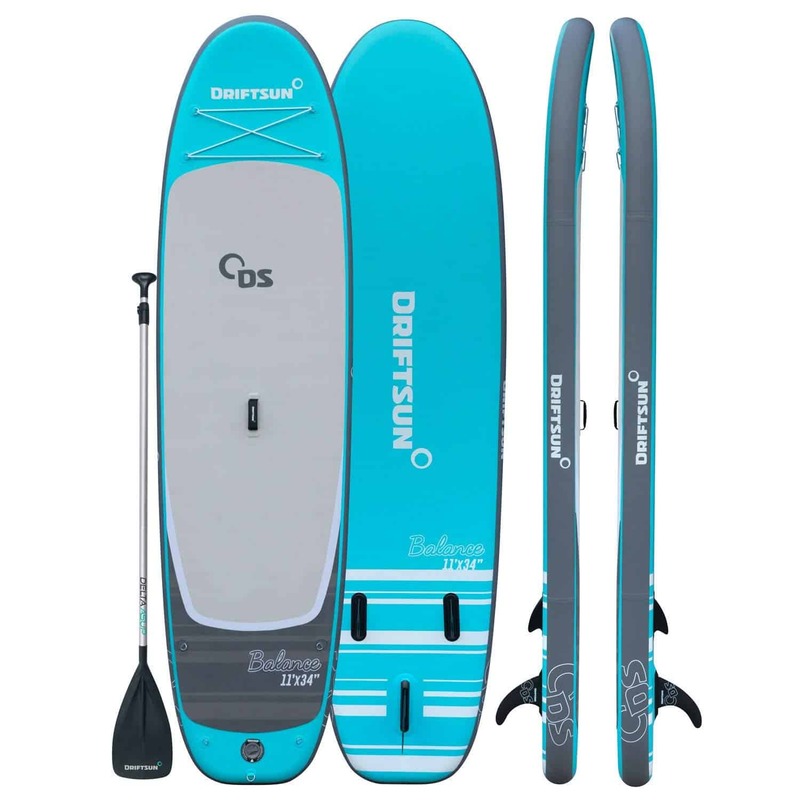 The board also comes with a tail mounted D-ring as well as a 6-point bungee system to give you a place to store any equipment you may need on the water. Weight: Board Weight 18 lbs. Max Capacity: Up to 275 Pounds. 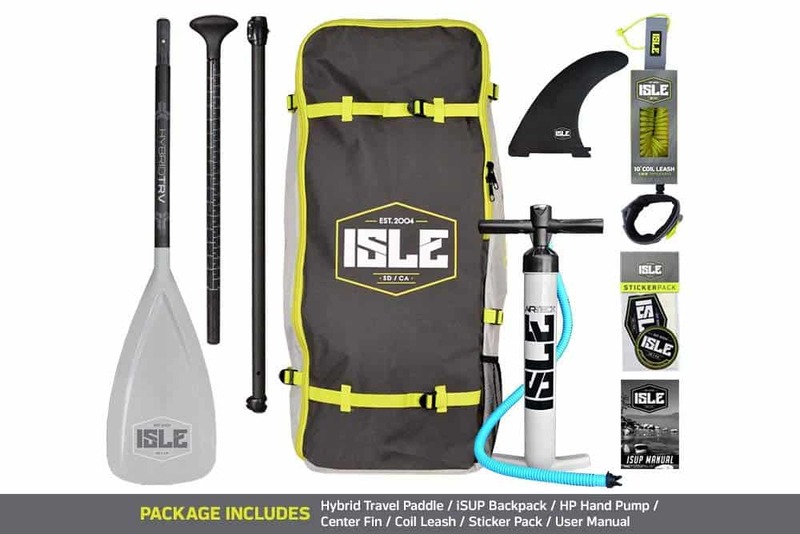 Accessories: Adjustable 3 Piece Alloy Paddle Nylon Blade (Yes, It Floats), Travel Backpack, 10 ft Coil Ankle Leash, GRI High Pressure Dual Action Pump with Gauge, 9-inch Snap In Center Fin, Bonus Water Proof Smart Phone Carry Case. While there are many people who regularly take yoga classes, sometimes, depending on your career, you may need to make other arrangements to get a yoga session in, especially if your traveling on vacation or for work. 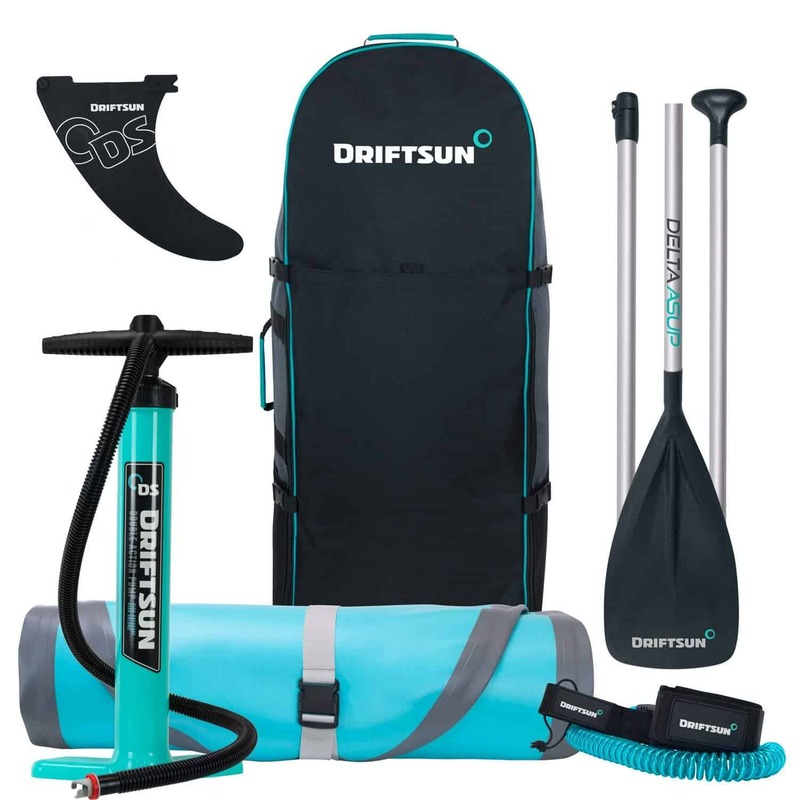 With a deluxe travel bag that not only can be carried as a backpack but also has wheels, the Balance 11 Yoga SUP Inflatable Stand Up Paddle Board from Driftsun might be the travel SUP you’ve been looking for. Designed with a wider nose and tail, the Balance 11 ISUP package is crafted to hold up to 100 lbs in order to provide you with maximum stability when you’re on the water. A larger EVA traction pad on the deck board provides you with a stable and comfortable surface for any yoga class or even if you just want to paddle around the lake. The SUP from Driftsun is “virtually indestructible” with its construction using tough military-grade, drop stitch PVC using MLS technology to give you a board that is six inches thick that can withstand just about anything you put it through without any visible dings or cracks ruining this ultra-durable SUP. The board itself comes with a cargo bungee that helps you keep any items you don’t want sinking to the bottom of the lake securely fixed to the board as well as D-rings that can withstand over 100 lbs of force, which is great if you want to use an anchor for your board. In the middle of the board is a comfort grip handle, which can be a great support point as you stand on the board or lose your balance, but is even better as a super-simple carrying handle when you need to carry your board. A quick-clip fin makes it easy to install or remove the fin without the need for extra hardware. With a lightweight collapsible paddle, coil board leash, and dual action pump included, you can be perfecting your downward dog pose in minutes. Weight: Board Weight 28 lbs. 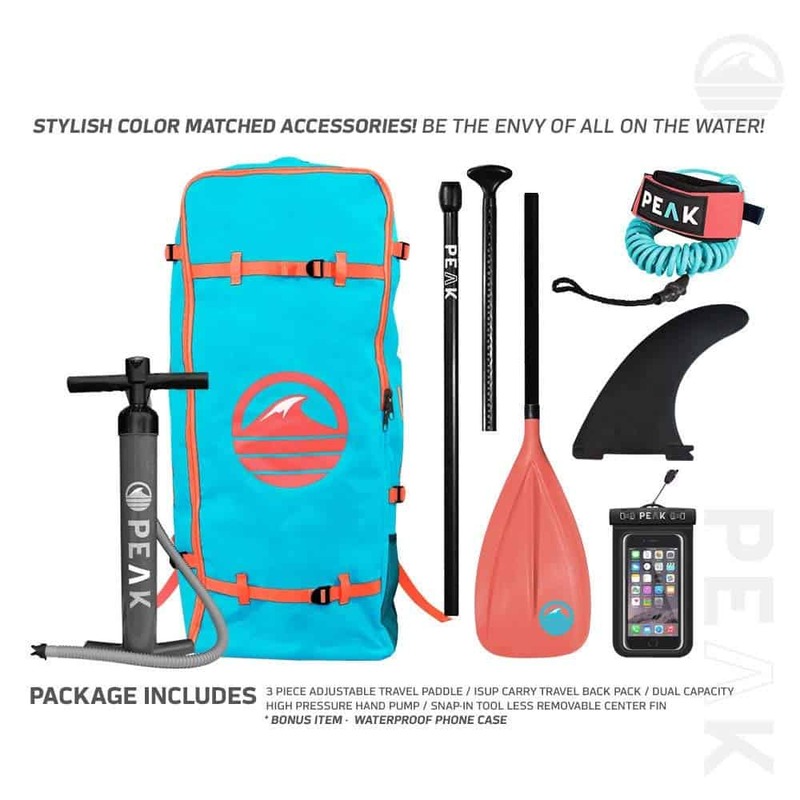 Accessories: Includes travel carry backpack with rolling wheels, 3 piece lightweight aluminum paddle, coil board leash, removable center fin, repair kit, and a dual action pump. With a SUP boarding, there are typically two main choices for the type of hull a paddleboard will come with. The type of hull a paddle board has will be a major factor in how the paddle board performs in the water. 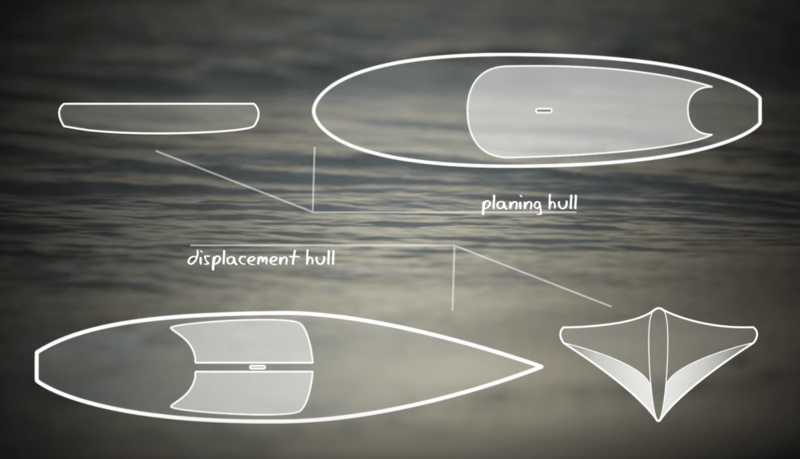 These two types are known as a Planing Hull and Displacement Hull. While either type of hull is a good choice for a beginner, there are differences between them that make them better for some activities over others. Knowing the difference can make choosing the right one easier. A stand-up paddle board with a planing hull is flat and wide, much like a surfboard. They are designed to ride on top of the water and can be very good when it comes to maneuverability. Boards of this type tend to be a good choice for yoga. A displacement hull SUP comes with an a-pointed nose, much like a surfboard. 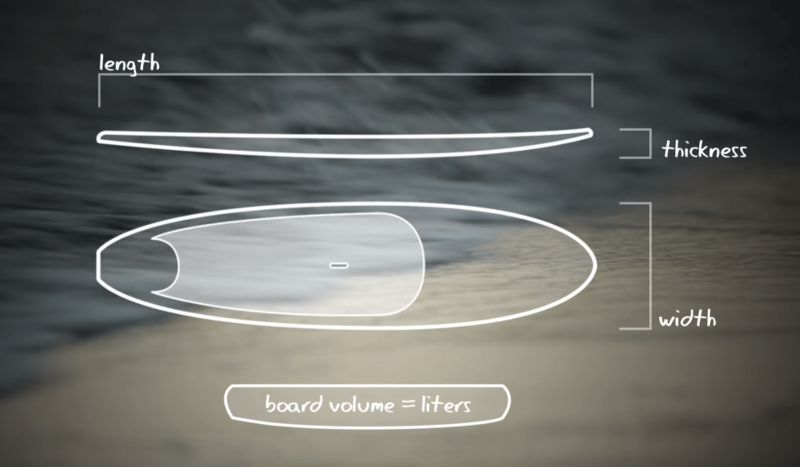 A stand-up paddleboard with this design slices through the water, pushing the water around the nose and sides in order to improve efficiency as well as create a smooth and fast ride. 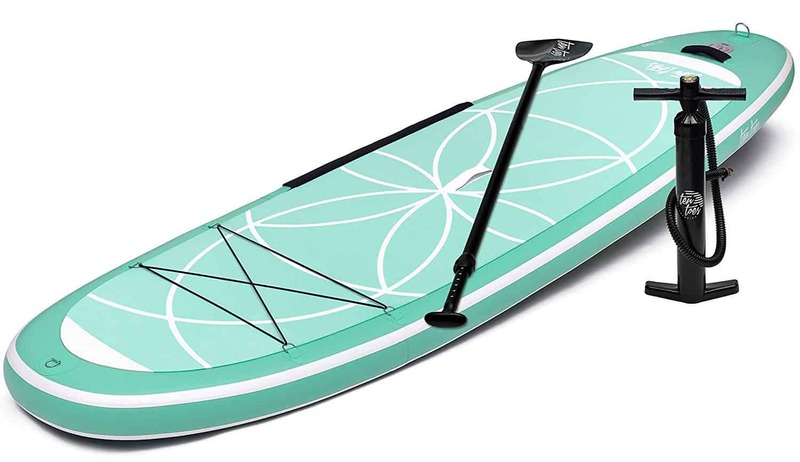 While these types of paddle boards aren’t typically used during yoga sessions on the flat water, they can be a good choice if you are doing regular paddling for fitness. Regardless of the hull type you choose, the construction of the stand-up paddle board that you choose is generally available in two different variations, solid and inflatable. Many solid boards come with an EPS foam core that is then wrapped with fiberglass as well as epoxy. This leads to a lightweight, durable, and affordable paddle board. While some are made with carbon fiber, which can be a lighter and stiffer option, are also more expensive. On the other hand, plastic paddle boards are affordable but can be heavy and may not perform as well as other materials. Solid SUPs can come in larger sizes and shapes that are better tuned than inflatable models, which means you’re more likely to find one that fits you right. 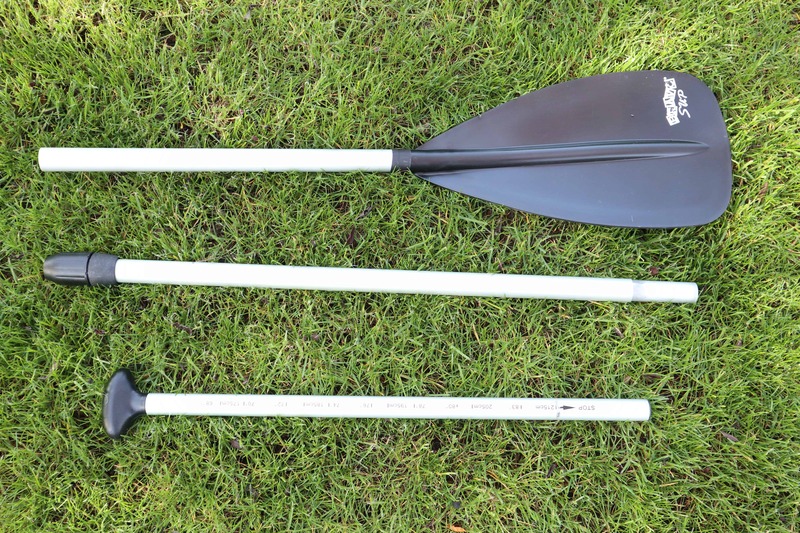 Inflatable SUPs have a drop-stitch construction as well as a PVC exterior in order to create an air core within the paddle board. Packaged with a pump in order to inflate the board as well as a storage bag for easy transport, they are typically designed to be inflated between 12 and 15 pounds per square inch and should feel completely rigid when fully inflated. An inflatable SUP can be a very beneficial choice if you have a limited amount of storage space at home or you tend to travel quite a bit. These can be a good choice for yoga sup boards as they tend to be a bit softer than solid boards, which can end up being more comfortable while doing yoga poses. In order for a SUP board to be effective, it has to work for the size of your body. If the correct amount of water isn’t displaced by the board, depending on your body weight, you may not have adequate support and the board may feel unstable. The weight capacity and volume of the board can affect the stability you feel while using the board and how well it moves through the water. These factors are determined by the length, width, and thickness of the board. These are combined by manufacturers to achieve different performance results. Expressed in liters, the volume of a indicates the board’s ability to float with weight added to it. The higher the number, the more weight the board can support. No matter which paddle board you buy, each one has a rider weight capacity, which is listed in pounds. Knowing what this capacity is prior to purchase is important. If you’re too heavy for a board, it will end up riding lower in the water and be much harder to paddle efficiently. Paddleboards with a planing hull tend to be more forgiving as long as you’re below the weight capacity for the board, it will still perform quite well. On the other hand, a displacement-hull board the volume and weight capacity is more important. If you put too much or not enough weight on the board, it may sink too low, drag and feel slow or it won’t sink enough, feel heavy and be difficult to control. How long the board you choose is important as it can determine how the board handles in the water. Longer boards are faster, but you can have more maneuverability with a shorter board. When choosing the length of a bord, understanding how it relates to volume and weight capacity is helpful. Considering the length of the board is important to consider as it relates to transportation and storage when not in use. The thickness of a SUP is important when considering which board to buy because it can affect the overall volume and weight capacity. Even if you’re looking at two identical boards, but they have different thicknesses, the thicker board will have more volume and the higher the volume, the more weight it can support. The width of the board can affect how it handles in the water. Wider boats will always have more stability that skinny boards. But a wide board can be slower and if it’s too wide for you and can be difficult to paddle. The overall volume and weight capacity are affected by the width of the board just as they are in regards to length. This is something to keep in mind when you select a board. While buying the perfect paddle board for your yoga workout is the focus of our list, unless you’re using the paddle board on dry land, you’re going to need some accessories to help you have an enjoyable experience and also stay safe. When you’re out on the water, unless you want to float to and from the shore, you’re going to need a paddle to get where you’re going. The design of a SUP paddle makes it look like a stretched-out canoe paddle that has a tear-drop-shaped blade angled forward to help you move as best as possible. The right length for the paddle will reach your wrist when you stand it up on the SUP and hold your arm over your head. Classified as a vessel by the U.S. Coast Guard, a stand-up paddleboard, when being used outside of swimming or surfing area, requires you to wear a PFD. 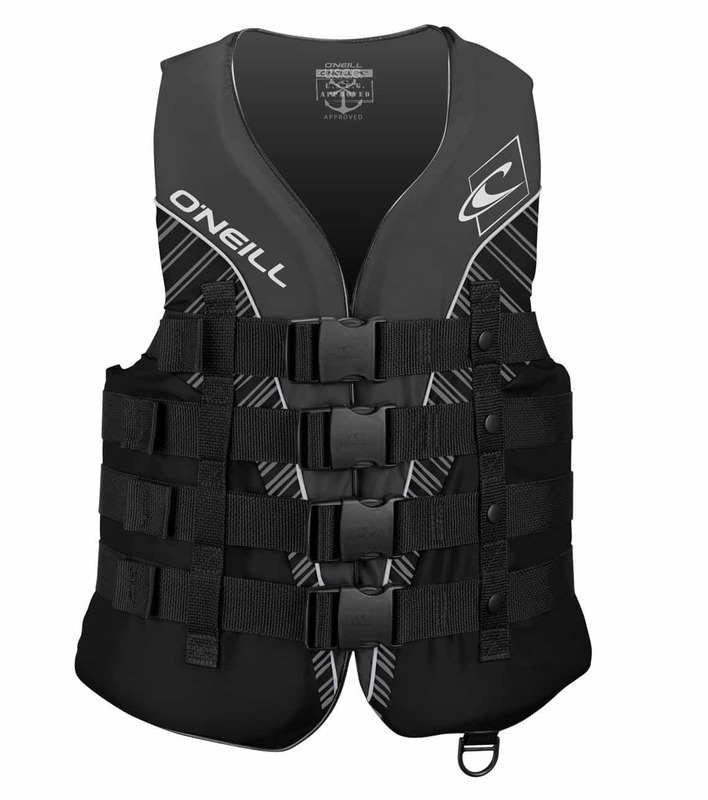 There are many classes that will make wearing a PFD a requirement during the paddling portion of the class and not so once you begin yoga class. While we are not recommending it, taking part in the yoga portion without a PFD does increase mobility, but it is your decision to do so. Be sure to also read our in depth blog on SUP PDF’s. Even with all of the boards that are out there for you to use during SUP yoga, having the correct clothing is about comfort, not fashion sense. While there are options out there that will cost you more than it should, there are also a lot of options for those who may be budget conscious. For many yoga practitioners, once they hit the water, wearing swimwear is many times a more comfortable option. For women, wearing a bikini or one-piece suit will suffice as long as you are comfortable, Men can wear either board shorts or swim trunks. A rash guard is an athletic shirt comprised of a nylon and spandex blend. This shirt is designed to protect you from rashes that may be caused by abrasion as well as protect your skin from sunburns. Rash guards are available in many different colors and patterns as well as sleeve lengths. These yoga-specific options are typically worn in 90+ degree classes and are also a good choice to wear when you’re on the water as well. If you decide to wear these, choose dry wicking options that won’t weigh you down once it gets wet. While it’s recommended that you wear sun protection during yoga, even on cloudy days, sunblock can’t protect your eyes from the sun’s rays. Choose a pair of sunglasses that have excellent UV protection and that you don’t mind losing in the water if they fall off your head, or you could get some eyewear retainers to keep them from falling in the drink. When you’re on your board, you’re likely going to be barefoot, but before you get that far, you’ll have to journey over asphalt, dirt, rocks, and shells, wearing water-safe shoes is highly recommended. While you can get away with flip-flops or water sandals, make sure that they are a good quality pair that will last a while. We don’t mean the leash you have for your dog, although the purpose is similar. Typically, these are sold separately from the board, it tethers you to the SUP so that if you fall off, your board won’t float away. When taking part in SUP yoga, you will want to use the leash while you’re paddling out from the shore. Once you’re in place, you can take it off your leg and anchor your board to keep it from moving. If you don’t anchor your board, it’s a good idea to keep the leash on in case you fall off. While it’s not a requirement, some yogis prefer using an anchor during class to keep from drifting around which can become distracting. Anchoring your SUP during yoga with a group can keep everyone together and keep boards from hitting each other. Once the anchor has reached the surface, let a few more feet of rope out. If you have excess rope, tie off the remainder to the leash anchor point and pile up the excess rope at the tail of your board. Unless you already live within walking distance of the water or have an inflatable SUP, transporting the board is not easy without using your vehicle. 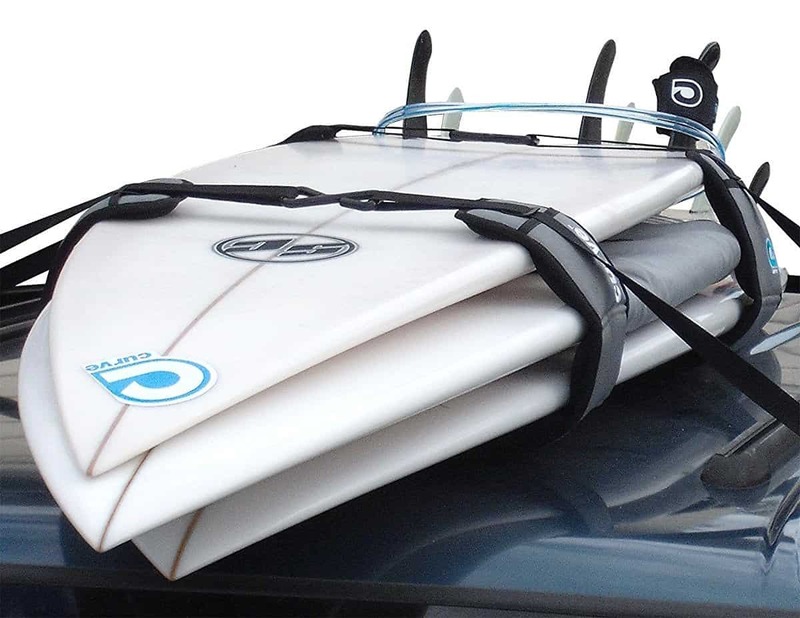 Car racks made specifically for SUPs are designed to be installed on the crossbars of the roof rack on your car or if your car doesn’t have roof racks, you can use padding, such as foam blocks as well as utility straps to secure the board to your vehicle’s roof. We have a great in depth blog on the best SUP car racks here. When it comes time to buy the best paddle board for yoga, there can be a lot more choices out there than you might have thought. At first glance though, it may be easy to label each paddleboard out there as basically the same. Because of this, before you buy anything, you need to make sure you do your research so that you are getting one that gives you the features, the design, and can help you reach new heights in your workout. We hope you’ve enjoyed our buying guide for SUP yoga boards. Be sure to check out some of our other reviews and blogs for more great information.